PLYMOUTH, N.H. (March 30, 2017) The Marketing Association at Plymouth State (MAPS) placed first in the nation at the American Marketing Association’s SABRE business simulation. 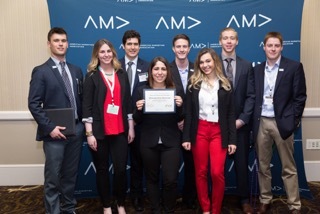 The group competed against 36 other colleges and universities including such prestigious institutions as the University of Pennsylvania, Cal Poly San Luis Obispo, Johns Hopkins and one of the most successful AMA chapters in the country, University of Wisconsin Whitewater. In addition to their first-place finish in the SABRE business simulation, sophomore Matthew Puelo placed 3rd in the sales competition. Click here to watch MAPS students share about their victory with WMUR’s Fred Kocher. Overall MAPS earned a top 25 finish, a testament to the strength of the students’ academic preparation as they competed against 384 other colleges and universities from across the country. In addition, MAPS is designated as an American Marketing Association Collegiate Chapter of Excellence across all 6 key competitive areas including membership, fundraising, professional development, community and social impact, communications and chapter operations. MAPS is emblematic of Plymouth State’s integrated clusters approach, which provides experiential learning opportunities inside and outside the classroom to prepare students to be tomorrow-changers and global leaders.